For Rita Cosby her father was a mystery. He was not like other fathers. He had scars on his back, holes in his arms, slashes on his legs. How did he get them? She didn't know. On Christmas Eve 1983 Rita's father walked out on his wife, Rita and her brother. For many years Rita had little or no contact with her father. Rita's mother died and it took Rita six years before she was able to sort through her mother's belonging. In doing so she came across an old battered tan suitcase which she had never seen before. She opened it and found it contained items belonging to her father. The items were remnants from a war. A worn Polish Resistance armband. Rusted tags with a prisoner number from Stalag IV B. The identity card had the name Ryszard Kossobudzki on it. Rita asked herself what horrors had her father endured before he emigrated to America. She was determined to find out. Rita arranged to visit her father at his home in Virginia. She had immersed herself in the history of Poland and World War 2 and had many questions to ask him. She started by asking him what his first memories of the war were. Ryszard recalls the outbreak of war on 1 September 1939. German planes bombed Warsaw where he was living as a 13 year old with his parents. The family fled Warsaw on a horse drawn cart and headed for the Romanian border. Before they got there the Soviet Union invaded Poland from the east on the 17 September. They were trapped. They turned the cart around and headed back to Warsaw. They arrived in Warsaw a few days after the heavy bombing of the 25 September. Warsaw was in ruins and their home was destroyed. Before the war Ryszard had joined the Young Eagles. A scouting organisation which organised camping trips and survival training. After the German attack they became part of the Polish underground resistance. Ryszard became a courier and distributed hundreds of anti-Nazi leaflets. He began training for more aggressive action and took the code name of Rys. On 1 August 1944 the Warsaw Uprising began. The Polish underground resistance launched their attack on the German army. Ryszard was a member of the Gozdawa battalion. His unit was led by Lieutenant Stan. They set out to capture a German weapons cache. Lieutenant Stan surveyed the way ahead with his binoculars. A shot ran out. Lieutenant Stan collapsed at the feet of Ryszard. A German sniper had killed him. Henryka, a young Resistance girl, was a messenger. She dodged the sniper's bullets to deliver information between the different units. She was a friend of Ryszard and told him that a German tank had been abandoned not far from their location. She intended to go with others to capture the tank. Ryszard feared a trap and begged her not to go. The resistance captured the tank and brought it to a square in the old town. The tank exploded. It had been booby-trapped with mines. By the end of August 1944 the Old Town was surrounded by the Germans. The Polish underground fighters were ordered to escape to the City Center. Their only exit - the sewers. After several hours they emerged from the sewers. Ryszard was left with a permanent scar on his forehead from where the machine gun had been hitting against him. More than 5,000 Polish resistance fighters escaped through the sewers within a 24 hour period. Ryszard was sent with another fighter to look for ammunition that was to be dropped by parachute that night. They were walking across a courtyard when there was an explosion from an artillery shell. Ryszard was thrown in the air and landed hard on the ground. He was bleeding profusely from wounds inflicted by shrapnel. Ryszard was taken to a hospital: an apartment block on Bracka Street. A doctor removed the shrapnel without anesthesia. Rita now knew how her father had gotten his scars, holes and slashes. On 2 October 1944 the Polish resistance surrendered to the Germans. The Warsaw Uprising was over. The Germans agreed to treat the Polish fighters as prisoners of war. Ryszard was evacuated, along with other wounded Polish fighters, to Germany on a Red Cross train. Their destination was a German prisoner of war hospital. In January 1945 Ryszard was moved to a prisoner of war camp: Stalag IV B. By the April of 1945 the Soviet Army was very close to the camp. Ryszard did not want to be liberated by the Russians. He and some of the other prisoners decided to take the risk of trying to escape. A hole was cut in the camp wire and the prisoners ran into the darkness. They headed west towards the American lines. After travelling for 50 miles they reached a small river. On the other side was the American forces. Ryszard and his fellow prisoners crossed the river into safety and freedom. Richard Cosby (formerly Ryszard Kossobudzki) died on 25 June 2012. 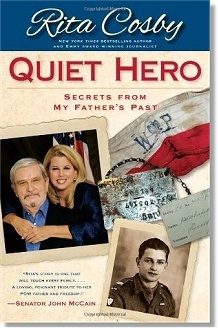 Listen to Rita Cosby as she describes her father's story. Richard Cosby (formerly Ryszard Kossobudzki) was awarded the Daughters of the American Revolution Americanism Award on 2 July 2011. Richard Cosby and his daughter Rita were interviewed at the event by the Polish Embassy in Washington DC, USA. Publisher - Published by Threshold Editions, New York, in 2010. This page was added on 02 September 2011. Updated on 06 April 2016.